I visited the Altwheels Festival in Boston last weekend and chatted with Mike Dabrowski about his 100 mpg Honda Insight. Mike is a hobbyist and energy conservation enthusiast. His car has a manual electric drive control. It's a system that a skilled driver can use to increase miles per gallon by 10-20% and learn to better manage the mix of gas to electric. In a modern hybrid vehicle such as the Toyota Prius, the car makes the decision when to engage the electric motor. Mike's car works differently. It lets the driver control the mix. The car has a little joystick that you can push to make the electric motor turn on and assist in an uphill, or pull back to switch the car into charging mode in a downhill. The motor assists or charges in proportion to how far you push or pull. Mike has also added auxiliary batteries so the electric motor can be used without a need to get energy from gas or momentum. The batteries can be charged with solar or from the grid. 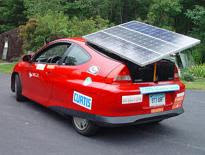 The system can run for 1 hour boosting the mpg to 100. The really unique feature is a fifth wheel that provides an EV mode. The car can travel in this all-electric mode at 30 mph for over 35 miles, which is great in stop-and-go city traffic and mall parking lots. While the car is an amazing engineering sandbox, talking to man himself is the real treat. No matter what question we hurled at him, Mike had an answer. As he experiments and tweaks, he puts his brain to work. There is a huge difference between someone who just promotes a product at a stand and a true hobbyist like Mike.